I like to read contemporary books about motherhood. 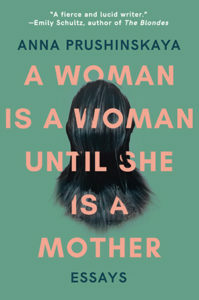 I read them with great interest in how the work of motherhood is being continually recast in relationship to all the other work (and self-care!) we now seek to do. Being a mother used to be women’s biggest role, and now must be balanced alongside a dizzying array of other demands and desires. It’s also stunning to me that for a time, it wasn’t even really okay to say that pregnancy, birth, and motherhood are weird, difficult, painful experiences—ones that not everyone wants to have. Motherhood was meant to be the purest essence and expression of femininity. Purpose and joy, bathed in white light. How did anyone ever sell that story to flesh-and-blood women, I often wonder, and get away with it for so long. Fortunately for me and many other readers, our reckonings with motherhood are growing increasingly nuanced. I cherish books on the subject that say in new and challenging ways that it is in fact strange, that it’s uncanny, that it’s really hard, that pregnancy makes you wonder about your ancestors and makes things smell different, that having a baby lends the most literal possible meaning to the term “life-altering.” To me, those frank admissions, when balanced against the everyday awe that parenting entails, tell a truer, and far more interesting story. To the chorus of writers thinking about this theme we can now add the singular voice of Anna Prushinskaya. 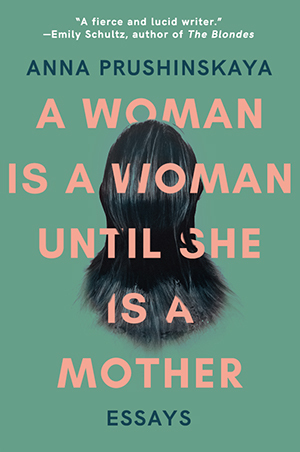 Her book of essays, A Woman Is A Woman Until She Is A Mother, meanders artfully through a pregnancy and into the wilds of early motherhood while provocatively contemplating nature, womanhood, and family. It is a serene but deeply felt rumination on this complicated passage, and on the many ways it connects us to the past, both our own histories and human history broadly. I interviewed Anna via email, where we discussed her book, her writing practice, and the usefulness of Ina May Gaskin’s “Sphincter Law” during labor. Nina Renata Aron: You write beautifully about the distance you feel from Uzbekistan, where you spent the first years of your life until you were a teenager, and where some of your family still resides. You write about the kind of ghostliness we live with when loved ones—and another life we once had—are elsewhere, far away. And the intrusions of uncanny moments of harmony; the feeling that your grandmother is waking up at the same time as you, for example, or the sense that you can feel her in the air. Has motherhood strengthened those associations with your past? How does your homeland manifest in your life as a mother now? Anna Prushinskaya: Before I became a mother, someone told me that my relationship with my own mother would change after having kids. I have found that really my relationship with everything changed, and that I have refiltered everything from before through the lens of motherhood. Your question about heritage and homeland is something that manifests day-to-day as I think about how I talk to my children about my own history, and how much of it will be lost in translation. I asked my two-year-old son if he knew that I was Russian the other day and he yelled, “No, mommy!” and cracked up. One nice thing about kids is that they can lighten up some of the moments in which I get a bit too far down a tunnel. The permeability of membranes, of the boundaries between one body and another, as well as between bodies of literature, are major themes of your book. And you quote Anne Lamott, who says both writing and motherhood have the power to “wake us up.” Do you believe motherhood equips us to better see connections? Something I try to not do is compare motherhood to non-motherhood as better or worse. Motherhood for me was a seismic and yet incremental shift in identity, and so I have been working and reworking my life in the context of that shift. I imagine that non-motherhood provides similar opportunities for reframing, waking us up, and connecting, as we all have a thing or two that changes everything in our lives. But it is hard for me to imagine what it’s like not to have that thing be birthing and children, because this has been my path. I read that you are a doula. How did you become interested in birth work, and how has that work informed your writing, specifically this book? It may be a bit too “on the nose” to liken the production of creative work to birth, but do you see any fruitful parallels? I took a weekend doula training while I was pregnant with my second son, and I began to volunteer as a doula in the Dial-a-Doula program at the University of Michigan hospital right after that. That is to say I’m very new to it, and I’ve taken a pause since my second son was born, until I can feel that I can fully focus on the birthing person again instead of having my attention on my own baby at home. I mention that all just to say that I am a complete novice and so my perspective on birth work is a novice perspective. What draws me to birth work is that it is possible as a part of your day to hold space for someone navigating birth. This to me is completely stunning, that the privilege of being there during birth is available. Aside from this aspect of helping hold space, there are also other dimensions. While I am no expert, I know that maternal care in the U.S. needs improvement (see recent ProPublica reporting series for a deep dive into the issue). Many studies have shown that doulas can improve birth outcomes in various ways, and I would like to be a small part of that if I can. About creativity and motherhood, I think there have been many opinions on the one side and on the other. I prefer to be an optimist on this one. I like the idea of a neurological link between motherhood and creativity. I wrote this book after my first son was born because I couldn’t stop writing right then, so for me, after that particular pregnancy, creativity came to visit. The chapter about your use of technology during pregnancy ends rather hauntingly with this passage: “He is only two months old, and I do not know the answer to the question of exactly what I’m missing when I mediate our relationship with technology. It is just that I have a growing sense of something missing, something, perhaps, that springs from the place where nothingness should be.” Has your relationship to technology changed as your children have grown? Do you still feel that something is missing? How have you negotiated this? This is definitely something I continue to think about often, in part because my professional work has to do with digital media so it’s everpresent in my life. I am thinking about the ways in which we can thoughtfully and compassionately use technology instead of having a permeable/non-selective membrane with technology, to refer to membranes one more time. Maybe my relationship with technology has changed in part because my first son called attention to the pattern. I am still working on being more thoughtful about how I use technology in my own life. I also do still think something might be “missing” in a sense, but I think that for me has to do with the broader project of having a relationship with the present moment that I’m happy with. I’m so curious about the process of writing this book, which is very poetic, somehow both fragmented and coherent. It seems sometimes like the writing itself is enacting what is popularly known as “mom-brain”—you move between many associations, thoughts, and emotions. How did the writing of this book occur? Could it be replicable? In other words, is this simply how you write, or was the creative process itself deeply impacted by pregnancy and new motherhood? I wrote this book during my pregnancy and after my son was born, mostly during my maternity leave. While I was pregnant, I remember waking up very early and not being able to go to sleep because I wanted to write. After my son was born, I disregarded the advice that one should sleep when the baby sleeps and I wrote during some of that time instead. I’m not sure if it can be replicated, but I haven’t felt that energy in the same way since then! I think the experiences themselves were so powerful on a personal level, but also so connected with many social issues I had been triangulating on. You say that “the experience of pregnancy essentializes.” Elsewhere in the book, you say of your home, “the birth was in the walls and in the ceiling, and the floorboard stained invisibly, all referring to my son.” Do you believe motherhood changes us in all ways, “staining invisibly” all that we do? Oh man, again, I would hesitate to ascribe aspects of my personal experience to all mothers. I think the experience of motherhood is so personal, and as I have learned since writing this book, motherhood is also always shifting and changing. For me, the moments of transitioning to motherhood were moments of clarity, of cutting through the things that I wasn’t able to cut through before. I was able to reframe and to understand some things differently, and this continues to happen. That’s all very abstract, of course. But then there is that experience of holding the baby right after birth, and if I just sit with that, of course my personal answer to your question is yes. I don’t know how that will change down the line, which is hard for me to imagine, as my sons and I continue to become more separate, as kids and mothers do.